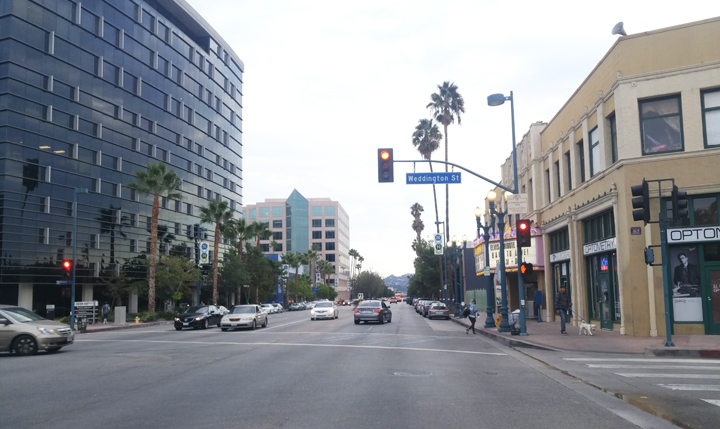 Lankershim is certainly a great street(or at least a good street with a questionable roadway), but it could be “The Street” in the San Fernando Valley. Right now, Ventura Boulevard holds that distinction with a number of great restaurants and shops running the length of the Valley’s southern edge. While the quality of businesses have been improving on this stretch, the overall numbers of establishments themselves have only gained slighlty over the years as the joined problem of parking and traffic allows only a limited number of patrons. I always point to the mall at Laurel Canyon and Ventura as always having one restaurant opening and another closing. 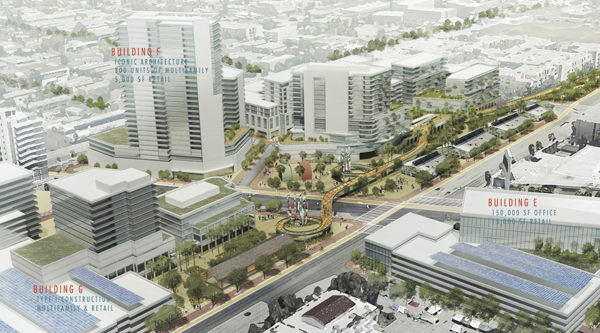 North Hollywood on the other hand is experiencing some serious growth and Lankershim serves as its spine. While there are three good sized projects opening soon, you ain’t seen nothing yet as megaprojects on Weddington and the Metro Station will transform the urban fabric on their own. With the intersection of the Orange and Red Lines already serving as one of Los Angeles’ busiest hubs, now is the time to properly shape NoHo’s future. 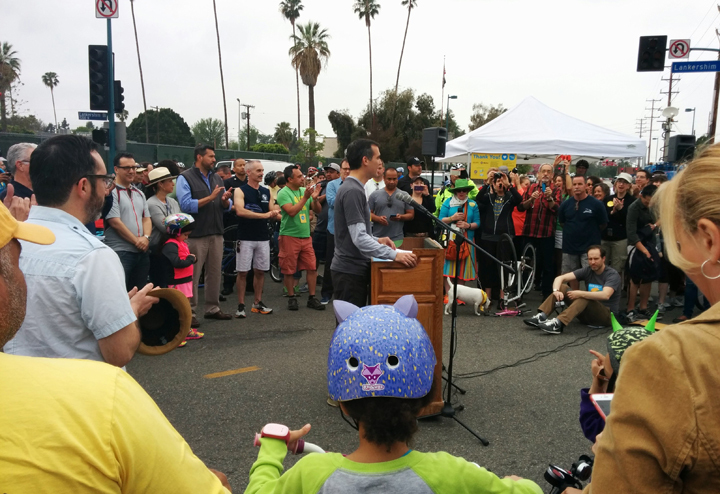 Lankershim was named as Council District 2’s initial representative for Mayor Garcetti’s Great Streets program. The study area originally covered from Chandler to Victory, but has now expanded south to Magnolia. I would prefer if the area included down to Camarillo / Vineland or even Riverside, but let’s focus what’s in front of us for now. Bike lanes have always been part of the vision for Lankershim, but they have consistently been thwarted by businesses, especially those that cater towards that sell transportation devices with more wheels than bicycles. Has Lankershim ever been busier than CicLAvia? Of course, after five years living nearby, driving is barely an option there when I go out because the search for available parking is not a time rewarding endeavor. Now that Great Streets program has moved forward with some great projects, it’s time to make North Hollywood a livable, human scaled community. What’s furthermore is that the connectability needs to be greatly improved. Although you can point to all the pipeline construction along Lankershim as the current fault, bike lines are desperately needed to the north to link up with the large working community that uses this vital transportation connection. Think about it. For most of the valley’s near two million residents, this is the closest connection to rail, even though it can be twenty miles away! You can also point the northern portion(where I grew up) being important for the number of small businesses that have struggled over the years needing better accessibility. Can you do something? Yes. 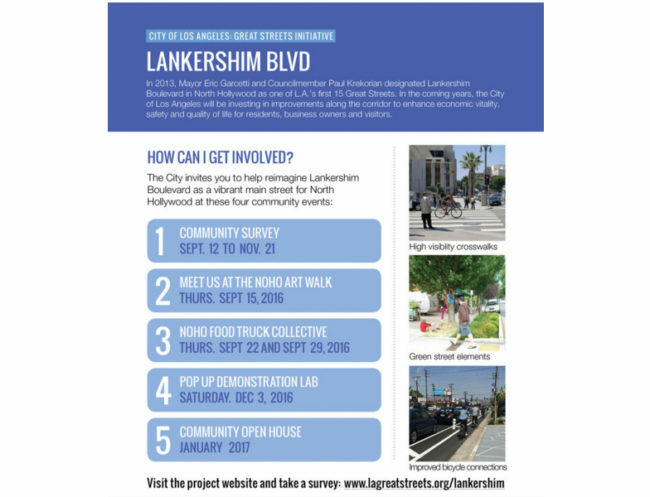 Please go to http://lagreatstreets.org/lankershim/ and fill out their simple suvery. You have the two minutes to do this. Then send this along to friends and make sure they leave their input as well. You can also learn more at a number of outreach events. Great Streets will be at the NoHo Food Truck Collective the next two Thursdays(22nd & 29th) and mark your calendars for the pop up demonstration lab on December 3rd. Lankershim has to have bike lanes just as much as you need to stand up for them.